CHICAGO, IL--(Marketwired - April 13, 2016) - The Illinois Technology Association (ITA) today announced the release of a first of its kind report that catalogs and categorizes Internet of Things (IoT) companies in the Midwest. 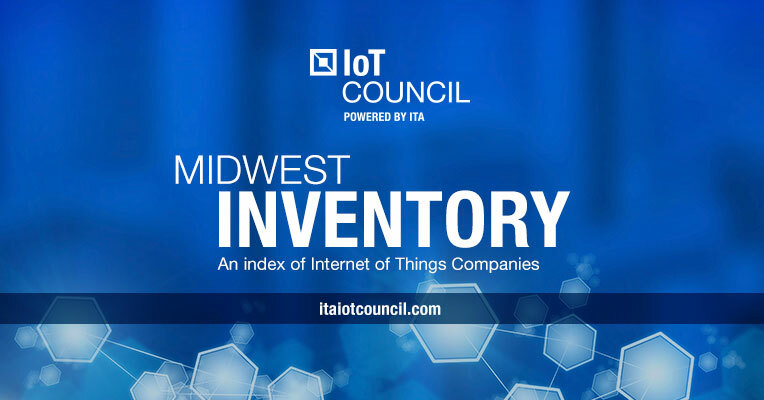 The Inventory was created by the ITA's IoT Council to formalize and visualize IoT's expanding presence in the Midwest. The Inventory includes 75 companies that have established a clear commitment to creating, selling or implementing IoT solutions. Companies in the Inventory range from those founded in the past few years and with fewer than 50 employees, to others with more than 10,000 employees and a strong presence in Illinois since the late 1960s. Setting up shop in Chicago in 2014, BMW Technology Corporation is one of the major players putting the city at the forefront of IoT with its connected-car-technology development. GE SmartSignal, based in Lisle, Illinois is also pushing the region forward as the leading provider of predictive diagnostics software and services used to anticipate and avoid surprise equipment failure. Named by Forbes as the hottest startup in 2015 and described by Fortune as "saving industrial giants from disruption," Uptake represents the power of the region's start-up and growth-stage companies. "It is our belief that Midwest is uniquely positioned to take a leadership role in IoT, more so than any other platform shift of the past 20 years," said ITA CEO, Fred Hoch. "With its established connections to manufacturing, transportation, agriculture, software, and analytics tools, the region has the necessary infrastructure to nurture the IoT movement into a dominant force in the tech industry. The depth and breadth of the Inventory proves that the Midwest can take the IoT revolution far beyond consumer products to exploit the true power and scope of IoT." "When we established the IoT Council a year ago, one of its initial goals was to raise the visibility and awareness of the Midwest as an epicenter of IoT technology, policy and industry," said Don DeLoach, CEO and president of Infobright and co-chair of the IoT Council. "With the release of the Midwest IoT Inventory, we have laid the groundwork and established a baseline with which to measure the future growth of IoT in the region." Having a primary IoT facility or a significant employee population and customer base in Chicagoland or the Midwest. The companies represented in the Inventory represent the leading edge of IoT in the Midwest. The ITA and its IoT Council are dedicated to helping current and future Midwest IoT companies achieve their goals through programming, support systems and peer-to-peer collaboration. Midwest companies that believe they should be represented in the inventory should submit their information for review. To learn more or download the full report visit itaiotcouncil.com. ITA offers innovative business services that enable Illinois technology companies to scale through collaboration, education, talent development and industry visibility. For more information, visit illinoistech.org, follow @ITAbuzz on Twitter or find us on LinkedIn.